The billboard marking the official handover of Marischal College to the City Council for their new headquarters is to be unveiled by Principal of the University of Aberdeen Professor C Duncan Rice and Aberdeen City Council leader Kate Dean later today (Tuesday, February 28). Professor C Duncan Rice said: "This will be a new beginning for a significant part of the both the University and the city’s architectural heritage. Marischal College is a landmark building, both in local and national terms. It will be pleasing to see it restored to its former glory. The University is hugely supportive of the Council’s plans to return the building to active use with all the wider economic and physical benefits that it creates." Council Leader Kate Dean said: "This is a marvellous chance for the City Council to provide a state-of-the-art workplace for our staff, where they will be better accommodated, and better equipped to provide top-class services to our citizens. It is important that our new Headquarters will also set an example in terms of energy efficiency, sustainability, and use of innovative technology." The Council site comprises the original Archibald wings and the Marischal MacKenzie frontage to Broad Street. The site also includes the area between the Mitchell Hall and the Lemon Tree, currently used for car parking. Under Council use, the quad will mainly be surfaced in granite but with two lawns at the eastern end, either side of a ceremonial route to the Mitchell Hall entrance. The rear quarter, including Mitchell Hall, will be retained for use by the University. 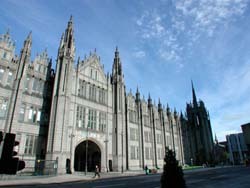 Marischal College is a landmark Category A listed building. It is the largest granite building in Britain and is reputed to be the second largest in the world.